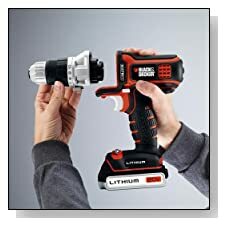 Utilizing their innovative MATRIX connect system Black and Decker have delivered a great value combo kit which any household could make use of. The Black & Decker BDCDMT120IA 20-volt Matrix Drill and Impact Combo Kit gives the tools that will cover the power tool needs of 90% of normal home improvements. From the video you can see that the Matrix Quick Connect System maximizes the number of power tools with easy tool-free changes of compatible attachments. This combo kit comes with the drill-driver attachment and an impact driver attachment. The BDCDMT120IA 20-volt max Matrix lithium-ion drill-driver contains the 20-volt max base power unit. This combo allows you to drill holes and fasten hardware with wood, metal, and plastic. The high-performance motor runs at 0-800 RPM and can deliver up to 1,300 inch-pounds of torque when in impact driver mode. The whole design is very compact whilst remaining powerful. 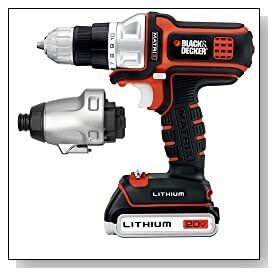 How Black and Decker have delivered the BDCDMT120IA 20-volt Matrix Drill and Impact Combo Kit at such a great price is down to one simple fact, the MATRIX connect system only need 1 motor for both power tool heads! However adding additional functionality to the system may be an issue. Having 1 tool to do the job of more could never be as good as individual tools, it will save a lot of money and space in your tool chest.